The Mode setting on your Samsung Galaxy S8 is where you make some basic settings that describe the situation under which you will be taking your shot. The default is a single picture in Automatic mode. The Camera Effects icon is the leftmost round dot toward the bottom of the viewfinder. Sliding this icon to the right brings up the options shown here. The Camera Effects options on the camera viewfinder. Auto: Taking a single photo at a time is the default setting, which assumes average light. It’s a good place to start. Pro: This mode gets you to all kinds of camera settings that someone who knows what he or she is doing would want to control rather than let the camera make the choice. This includes setting the exposure, shutter speed, ISO sensitivity, white balance, focal length, and color tone. If you do not know what these mean, this is not the mode for you. Panorama: This setting lets you take a wider shot than you can with a single shot. Press the Camera button while you rotate through your desired field of view. The application then digitally stitches the individual photos into a single wide-angle shot. Slow motion: This switches you to video mode to slow down really fast shots. 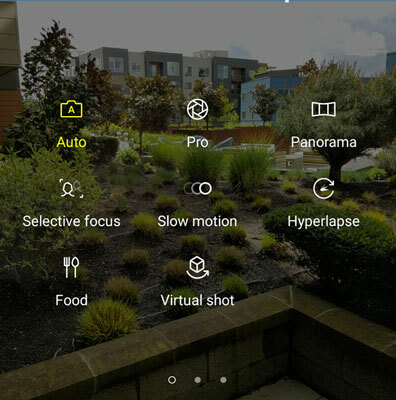 Hyperlapse: You can use this setting to create a time-lapse video. The video camera will adjust the speed of the shots based upon the movement of the phone. Food: This takes pictures that emphasize the colors in food to make your friends even more jealous (and/or hungry). Virtual shot: Put an image in the viewfinder and walk around it. The phone figures out where you are and creates a virtual tour. If this does not prove to you that your phone is a “smarticle,” nothing will. Choose the option that sounds right and snap away.